Updated Wednesday June 13, 2018 by Whitby Minor Baseball Association. 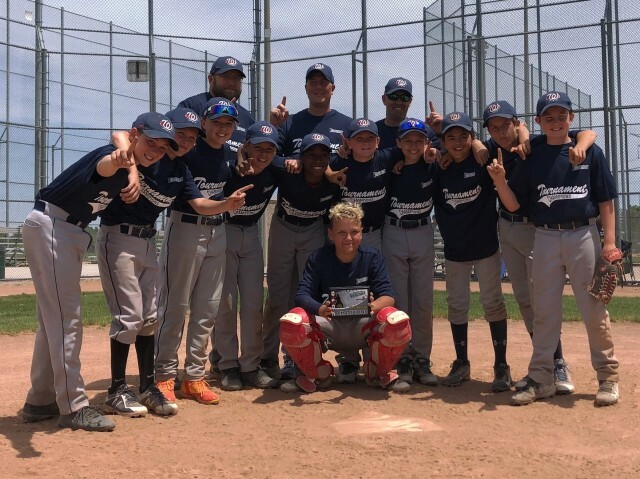 Congratulations to the Minor Peewee T1 Chiefs for an amazing weekend of baseball and earning the right to be called champions after winning the Vaughan tournament over the June 8th weekend. The Chiefs started the tournament Friday night against a strong London team. Adam led the Chiefs to victory on the mound. He went six innings, allowing one run on three hits and striking out three. Ben B threw one inning in relief out of the bullpen. The Chiefs scattered eight hits in the game leading to a 6-2 win. Saturday morning was a good reality check for the Chiefs as they lost to Mississauga SW. Despite racking up 9 runs on 10 hits, the Chiefs allowed 10 runs and only one of them earned. Allowing 9 unearned runs on 6 errors in the game proved to be costly, but maybe delivered a lesson that needed to be learned. In the afternoon, the Chiefs played Barrie. The Chiefs got their bats going and scored 9 runs on 11 hits, led by Brock who went 3 for 4 in the game. The Chiefs would go on to win the game 9-5. Winning this game moved the Chiefs into the quarter-finals. Later Saturday night, the Chiefs faced a tough team from North York in the quarter-finals. Markus H was clutch at the plate with ducks on the pond, driving in four on three hits to lead Chiefs past North York 12-9 on Saturday. Ben B earned the win for Chiefs. He allowed four hits and one earned run over four and a third innings, striking out two. Brock threw one and two-thirds innings in relief out of the bullpen. This was a big win for the Chiefs moving them into the semi-finals on Sunday. Early Sunday morning, the Chiefs faced a very strong Mississauga North team that entered the game unbeaten. The Chiefs fell behind in the first inning before taking a 3-1 lead in the second. Adam pitched well for the Chiefs going five innings and allowing no earned runs. The Chiefs went on to win 6-2 and advance to the championship game. In the Championship game, the Chiefs would face a Brampton team that they have not beaten over the past five years. The Chiefs scored 20 runs on 16 hits beating Brampton 20-2 and winning the tournament championship. The tough lesson learned on Saturday morning came in handy as the Chiefs played flawless defense in the Championship game and earned a huge victory. On behalf of the coaches and parents, we are very proud of how hard the kids are working to get better and watching them succeed this past weekend was an awesome experience. Congratulations to all the players for a hard-fought weekend, keep up the great work.